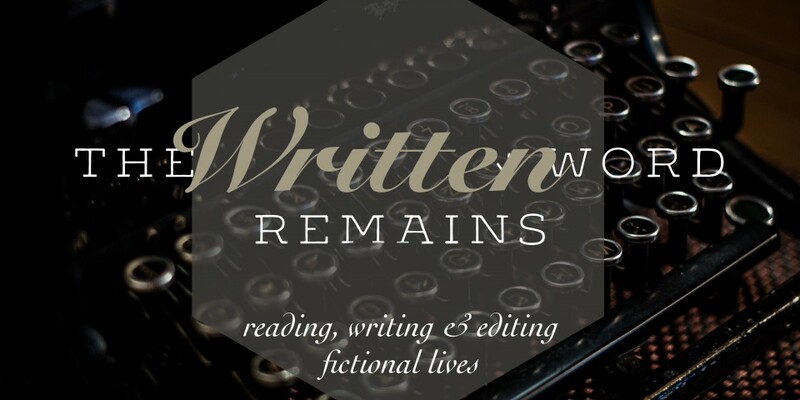 ~ Writing, reading & editing fictional lives. Is there any writing advice you like more than this one? No, honestly. Tell me. Many times as writers we are told to write through the block. To force the words out onto the page despite how awful or misled they might be. Indeed, there are month-long writing events to encourage that spewing forth of words. But what if that’s wrong? Don’t get me wrong. I’ve written about NaNoWriMo a lot, and participated for many years. But sometimes, blindly writing into a deep hole is not the answer. In fact, at times writing blindly and forcing yourself through a block will just force you down a path that your story should not be going in the first place. There is value in getting the words down, especially if you are merely procrastinating and not writing because you “don’t have enough time” or “the words aren’t perfect” or you’re caught up (endlessly) editing what you’ve already written. But if that’s not your problem and you’re facing a block of where you don’t know where you should take your protagonist next, or you don’t know how to get them from point A to point B, then maybe it’s time to step back and take a break. It can allow you to ruminate on different possibilities and where each might take you. It refreshes you for facing the problem the next day. Almost always when I have reached a point of exhaustion or block, taking a step back gives me clarity and the ability to focus when I return to my project. How do you work? 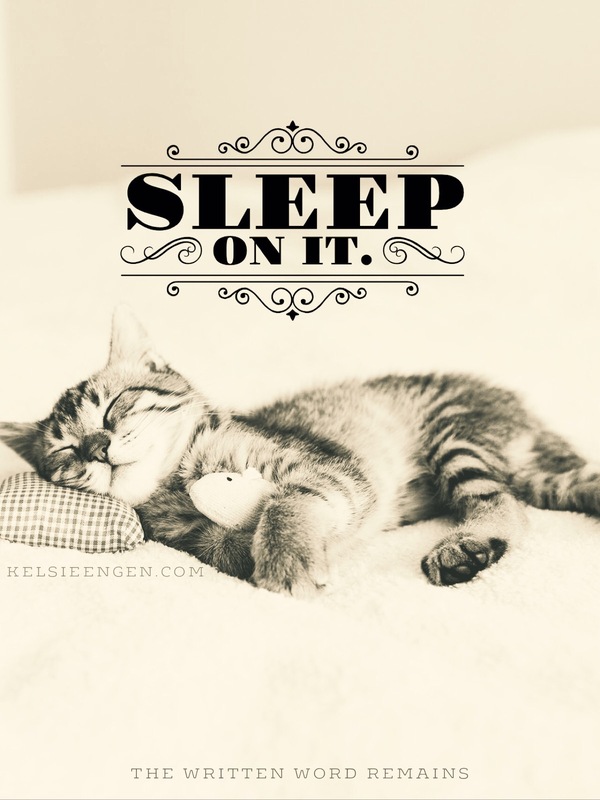 Does sleeping on it fix your blocks or do you have another method that works for you? Tell me in the comments below! Scrivener is being developed for iOS–really! Scrivener for iOS! It’s almost *almost* here. Can you see it? Can you smell it? Can you taste it? I can. Almost. Do check out the link below–this is so exciting. It’s currently in alpha testing, with beta testing not far away! via The Cellar Door » We Found That New iOS Developer, By The Way… (Me). Yeah. That didn’t really give you any idea about what my story is about, did it? In a nutshell, plot is what you’d say to someone when they ask “What is your story about?” This could also be considered your logline. But how do you figure out what plot is? Especially when you’re looking at your own WIP, plot isn’t so easy anymore. But it’s vital to your story–even a first draft, although it may suffer from identity crises of multiple varieties, plot shouldn’t be (but often can be) one of them. 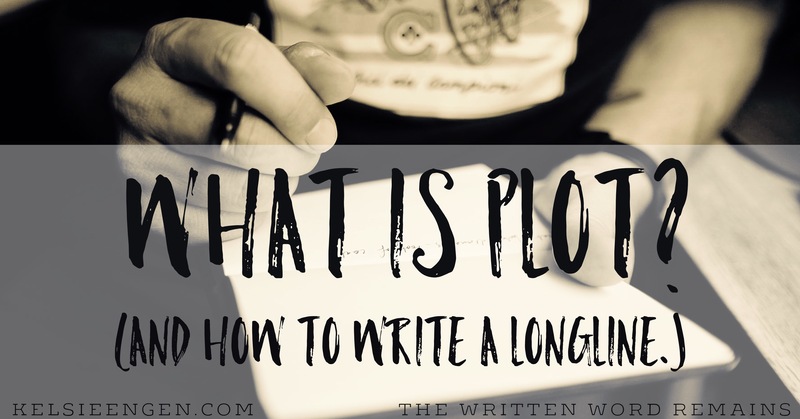 So how do you figure out what plot is? Plot seems so straight forward, doesn’t it? Until you go and try to figure out the plot of your own story. Then there’s a lot of hemming and hawing and indecision and confusion. Plot. It’s the bane of every writer’s existence, right? Because until you have a plot, you have nothing else. So in talking revision, it’s important to discuss and understand what plot is. There are many misconceptions about plot, and a lot of literary fiction books are accused of not having a plot at all because of their slow(er) pace. But plot is not only found in action packed thrillers or YA dystopians. Plot can be a creature slow and gentle, even-tempered without huge outbursts. The climax may be the character realizing their way of life is not worth pursuing. In a nutshell, plot is what happens in a story. If “nothing” happens, then the book is boring and plotless, right? Well, hold on. How do you define nothing? A thriller plot looks a lot different from a literary fiction plot, or even a mystery plot. But a lot can happen without someone saving the world. A character could discover that her mother lied to her her entire life. The climax could involve her forgiving her mother. A woman could meet a man and fall in love. The climax is her declaring her love to her chosen mate. Or a teenage girl could discover that the boy she goes to school with is a vampire, a discovery that threatens her life. How do you determine the plot of your own story? This one’s a bit trickier, even though it may seem not to be on the surface. One of the hardest things for a writer to do with their own work tends to be to boil down their story in a nutshell. But when you have to explain your work to someone else, what do you say? Chances are, whatever you say is part of your plot. Okay, so a plot is what happens in a story. But everything that happens in a story isn’t always plot-related. Let’s take the well known fairy tale of Snow White. What are the major events in Snow White? 1. The Queen is told she is no longer the most beautiful woman in the land. 2. Queen instructs the Huntsman to kill Snow White, but he fails to do so. 3. Snow White meets the 7 Dwarves. 4. Queen tries to kill Snow White with a corset. 5. Queen tries to kill Snow White with a comb. 6. Queen tries to kill Snow White with an apple. 7. Snow White awoken by the Prince. 8. Snow White marries the Prince, and the Queen attends the wedding. 9. The Queen is made to dance in the red-hot slippers until she dies. Which numbers do not pertain to plot? Feel like this is a trick question? Well, maybe. (Answer: 3 & 8) Basically what happens in Snow White is that the Queen is jealous of her step-daughter and tries to kill her so that the Queen can remain the most beautiful woman in the land. Everything else is superfluous to the plot. The romance is a subplot, and the dwarves are supporting characters that don’t prevent the Queen’s attempts or rescue Snow White. In other words, the Queen isn’t trying to kill Snow White because she met the Dwarves. No, that ball is already rolling. That’s not to say that their presences aren’t important to the story, but their presence doesn’t exactly interfere with the plot itself. Confused? Let’s break it down using Story Structure. Plot Point 1: …orders The Huntsman to kill Snow White, but doesn’t, sending Snow White into hiding. Pinch Point 1: The Queen finds out that Snow White lives and sets out to kill her with a corset. Midpoint: The Queen tries to kill Snow White with a comb. Pinch Point 2: Undeterred from her prior two failures, the Queen returns to try and kill Snow White with an apple. Turning Point 2: After many years, the Prince arrives and finds Snow White in a glass coffin, unaged from the time of her “death.” Falling instantly in love with her, he buys the coffin and Snow White from the Dwarves and begins to move her, during which a servant stumbles and dislodges the apple from her throat. She’s alive! Climax: Snow White and the Prince are in love, and they schedule their wedding. Resolution: The Queen is punished by being forced to dance in red-hot slippers until she dies. Snow White and the Prince live happily ever after. So the plot is that the Queen tries to kill Snow White. Okay. So number 2, Snow White meeting the 7 Dwarves has nothing to do with the Queen trying to kill SW. None. Take out the Dwarves and Snow White would still be a target. (That’s not to say that these characters don’t affect plot, per se, but they aren’t absolutely necessary to the plot. As opposed to the Queen, who, if she were removed from the story, there would be no story.) Number 7 is the same. Who cares if Snow White marries the Prince? In terms of plot, that doesn’t matter. In a country far away, a young girl named Snow White is being pursued by her stepmother, who is determined to kill her at all costs. Once upon a time, the most beautiful girl in the world tries to hide from her stepmother, who is so jealous of her beauty that she wants her stepdaughter dead. Note that neither of these follow the logline recommendation exactly, but that’s okay. The question to ask is whether it’s one sentence, and hits all the main points: setting, protagonist, problem, antagonist, conflict, and goal. Why is plot so important? Plot is what drives your story. In order to write a solid story, you must have a solid plot. So during your revisions, revisit your logline. If you haven’t written a logline before, write one now. Streamline your plot. What is your story about? What is the conflict, who is the antagonist? What is the protagonist’s goal? Here are a couple of sources from K.M. Weiland’s site: story concept, 6 reasons for writing a premise sentence that discuss the importance of knowing your story’s concept. They will help you in figuring out your own story as well. Tell me: do you use loglines in your revision? How do you craft them? One of the major things that hold back an author is the pursuit of perfection. It’s so easy to get trapped into this line of thinking. So easy that I’m not sure I’m completely out of its grasps yet (as a reformed perfectionist writer), but I’ve certainly come a long ways since I began writing. The truth was: it was never perfect, and it took a long time to be good enough. Not to mention how I told myself that I could always do better, just to soften the blow when critiques came back (which also undermined my efforts mentally). But one of the dangerous things about perfectionism, is that when your “perfect” scene or story is criticized, and often rightly so, you may not be able to continue working to improve it or part with it later. 1. Your work will never be good enough to share with others. 2. When you do share it with others, and they don’t find your work flawless, you suffer a hit to your esteem that makes it difficult to try again. You may just give up. 4. Perfectionism breeds fear of failure and inadequacy in yourself and others. 5. Creates such high standards for yourself that no one else will ever live up to them either, and you will be constantly disappointed by any other book you read or write. Revision is another form of writing, but it feels more permanent than a first draft. We revise with the idea of other people reading our work afterward, and when we reach the end of our edits, parting with our novel (or short story) to entrust another with it can be like baring a part of your soul to them. 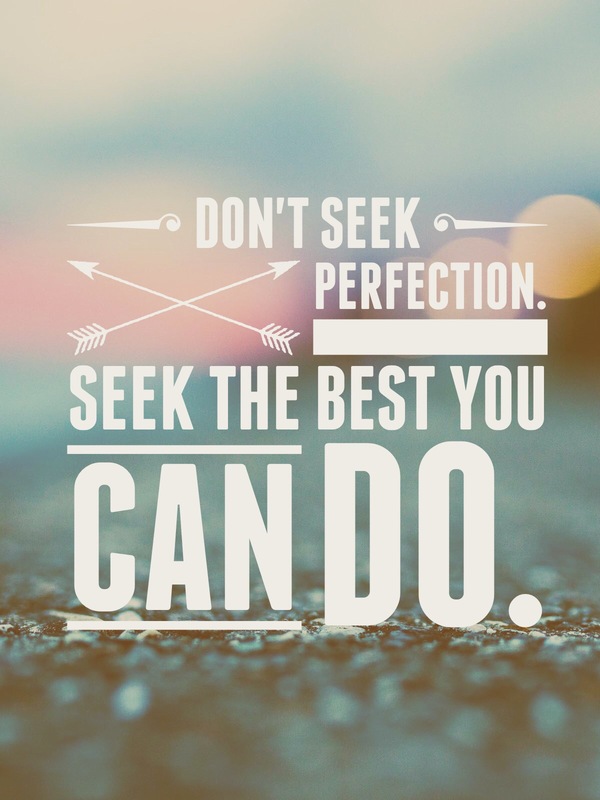 Don’t seek perfection. Seek the best you can do. When you’re a perfectionist, it’s like every time you put your best work out there (anytime you put work out there period, because it always has to be your best), and someone says something unkind, or even kindly critical, a little bit of your soul is bruised. Enough bruises and you don’t even want to try anymore. You want to give up. Well, I’m here, telling you, that you shouldn’t. Because that means you’ve let the bruises turn into a break. No work of art is perfect. But if it’s good enough, we look past any imperfections we may have found in our love for it. So focus on writing a story that is as good as you can make it, not perfect. Because no one can make a perfect story. 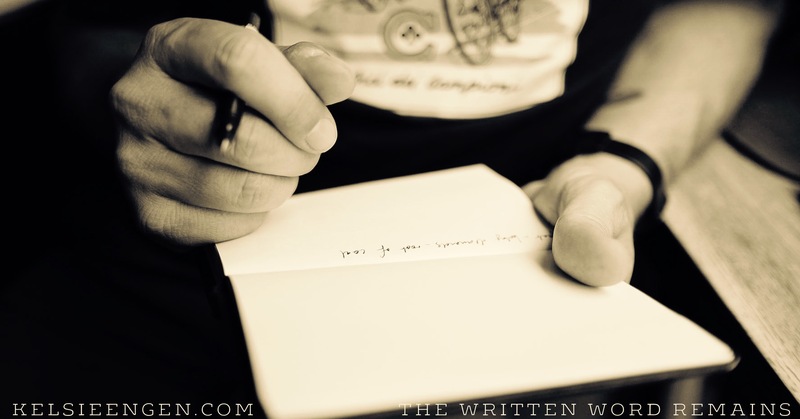 This week we’ve continued our progression through our How to Revise Your Novel series. I hope you’ve all been learning a lot, and maybe even able to put some of it into practice. I’ve been having a busy week, full of writing, rewriting, etc., and it’s amazing how life gets in the way, isn’t it? But I don’t want to make excuses for the fact that this week I only had two posts, as opposed to my usual three. That said, here they are! By the way, a huge thank you to all new visitors and followers. I wouldn’t be blogging without you, and I love to see comments or likes from new people. 🙂 You guys are great and make me feel as though I’m contributing valuable information for you. I do need to note though that I may be slowing down to one or two posts over the next couple of months due to several things that will be coming up for me. I’ll still be around, but I’m going to try to focus my “spare” time on polishing up my own WIP and submitting to Beta readers for feedback. Pay attention to timeline issues, character development/arcs, character motivations, scene motivations, pacing, etc. Those are my top 7 reasons for outlining during revision. Do you have another? Drop a note in the comments below! Books are magical things, aren’t they? As writers, we love to stumble upon a book that we find “magical.” But as authors, we know that there is so much more to a book than first appears. 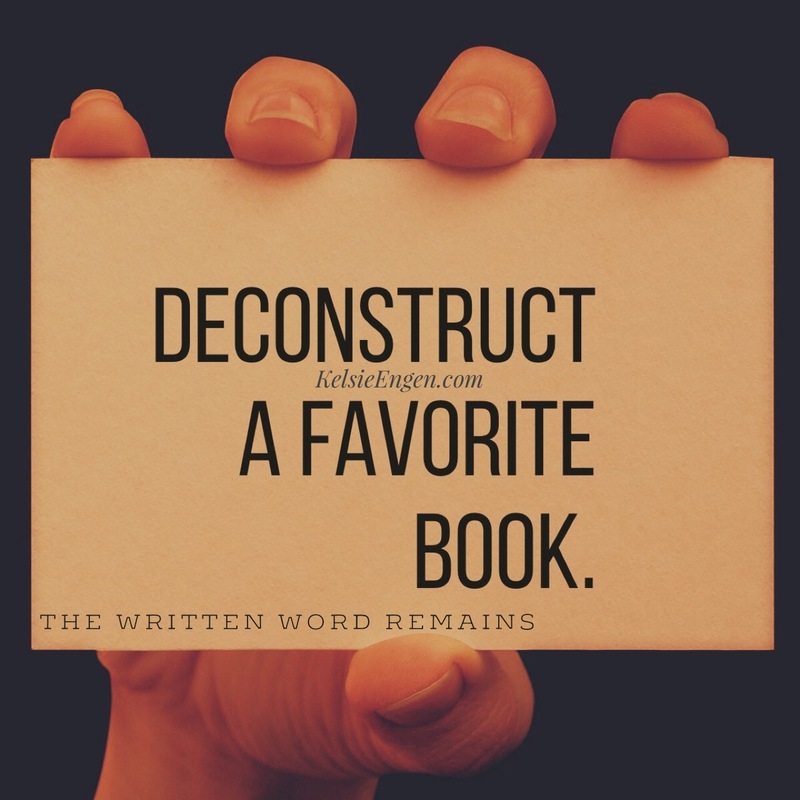 That’s why “Deconstruct a Favorite Book” is the tip this week, and it’s something that I am guilty of not doing often enough. Pick up one of your favorite books. It could be a classic, a mystery, a young adult, a dystopian, anything. But it will be easier if you keep it on the shorter side. Now read it. And as you read, pay attention to those defining moments every book has: hook, inciting event, pivot points, midpoint, climax, resolution. If you aren’t sure what those are, check out my previous article on it, or for a more in-depth look, K.M.Weiland’s series here. In houses, the underlying structure is only revealed by the walls and trim put over it. In books, the underlying structure is so natural to the story that you don’t pay attention to it individually. It would be like seeing a house and drawing attention to one wall. Unless that wall is pretty spectacular or pretty ugly, you’re not going to give one little wall a whole lot of attention. But now’s the time to really pull apart that book that you read and couldn’t put down the last time. Maybe it’s Suzanne Collin’s The Hunger Games, maybe it’s Jane Austen’s Pride and Prejudice. Maybe it’s Stephen King’s It. Whatever it is, dust it off, pick it up, and reread it. Entirely. Pay special attention to the 25% mark, the 50% mark and the 75% mark, because those are the spots where big things happen. But also look at those spots halfway between the 25 and 50% marks, and the 50 and 75% marks. Why? Because there are minor spots there too. But don’t stop at story structure. Look at transitions between scenes, examine characters and dialogue, conflict, scene and sequel, adverbs, adjectives, sentence structure, punctuation. After you finish the book, flip back through and see if you forgot something that turned out to be rather important. It could have been a character involved in the twist at the end, a foreshadowing, or a moment where the antagonist did something that hinted at the ending. Make a short outline of the book. 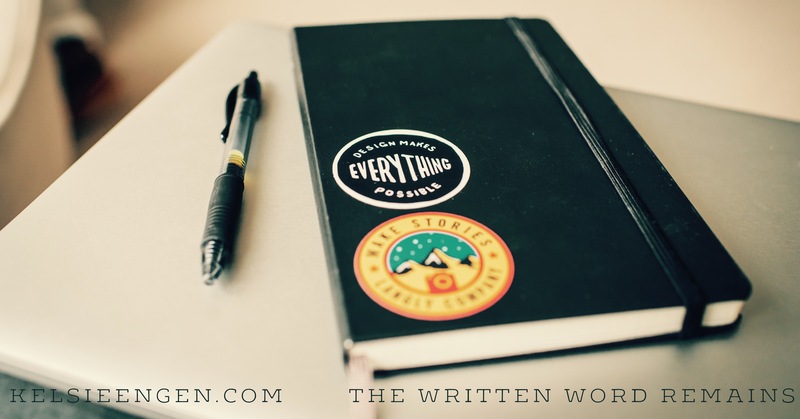 Don’t go scene by scene, but just jot down the main points, the story structure. What it tells you should be expected…almost boring. Look at your notes again and think. Focus on what it is about this book that makes you love it. You may worry that a study of this type will ruin your favorite book, and it might–if it’s not what you remember–but examining a book (any book) in this fashion is what will make you a stronger writer. Tell me: What is your favorite book? Have you deconstructed it? What did you learn? As part of my ongoing Scrivener Tutorial series, we’ve reached number 4. Previously I’ve discussed how to Create a New Document and Work with Scenes, Making Document Goals, and Cool Tools in Scrivener. Today in continuing with our Revision theme for January, I’m going to discuss how I use Scrivener when it’s time to revise, and why Scrivener is my go-to writing software for revision. 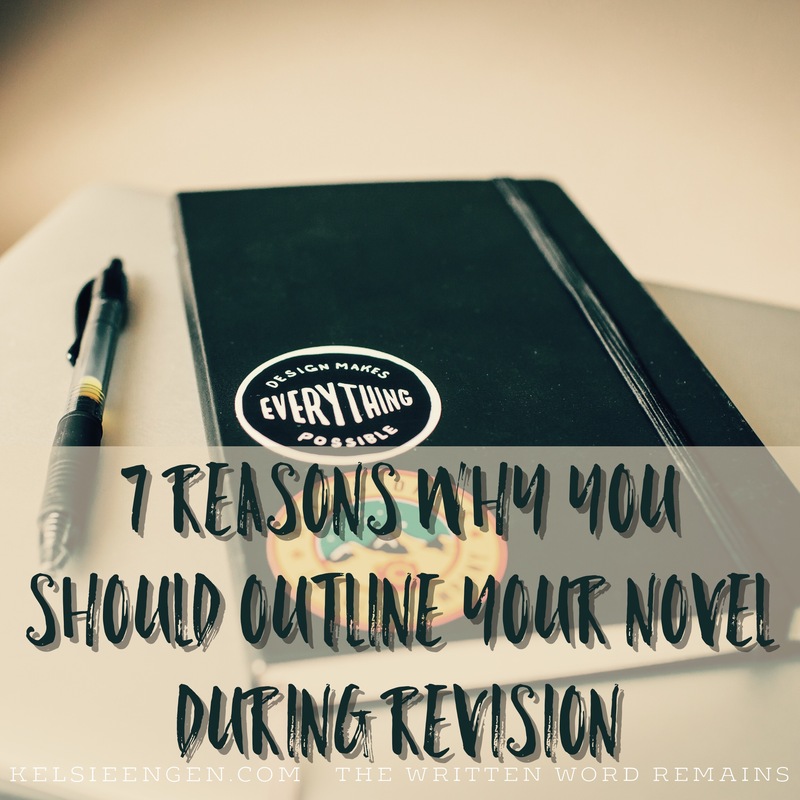 If you’re not sure of where to start with revising your WIP, check out the article I wrote on it back at the beginning of January: A Revision Checklist. This gives you pretty much any option you could need. I’ve not used most of them, but I have used the conversion to Word, epub, mobi, and PDF. I use this feature quite often when it’s time for rereading my story after I’ve finished a draft. It allows me to change platforms and reread my story with new eyes, thus allowing me to engage in a different reading experience. This feature is also something you find in Word and Pages and other word processing software these days. It’s incredibly convenient though to have them available in Scrivener as well. One of the nice things in Scrivener is that if you don’t wish to write something in the comment, which I don’t always do, it automatically inserts your name, the date, and time you created the note. Sometimes, it’s too much effort to write a note when I’ll know why I highlighted it by the time I return to it. A comment will create a yellow highlight over your text, and then appear in your Inspector to the right of your document/scene–only when the speech bubble icon is pressed. However, if you’re looking at tags or snapshots or something else in that section of your screen, you won’t be able to view your comments, a possible down side. Another nice feature of comments here in Scrivener is that if you have made a comment in the scene or document you are looking at, an asterisk will appear next to that speech bubble icon whether or not you have comments visible in your inspector section. So with just a glance over, you’ll be able to see if you have any comments you need to address in that scene. This is one of my favorite features of Scrivener, and one that I miss the most whenever I cheat on it. In a nutshell, snapshots prevents you from losing your original wording once you make changes. I’m one of those paranoid writers who hates to delete anything I wrote–maybe one day I’ll realize the changes I made were awful and I want to go back to the original story. But if I wrote my story in Word and when I edited it, I simply deleted that scene without backing up my entire Word document, I won’t have it to go back to. In Scrivener, if you took a snapshot, you’ll have it and will hardly have to go looking for it at all. Just like your comments, you’ll find the snapshots in the Inspector section in the right hand portion of your screen. When you click on it, you can cycle through all the snapshots you’ve taken and find the copy you want to return to. You have the option to “compare” your versions like I did in the picture below. But you can also “roll back” if you find a version that you wish to revert back to. So if I liked my previous version better, and want to start over from that point, I can revert back to it–but I also have the chance to take a snapshot of the current version before doing so. It’s a wonderful tool to use, and can allow you to revise without worry, as well as without juggling multiple files. 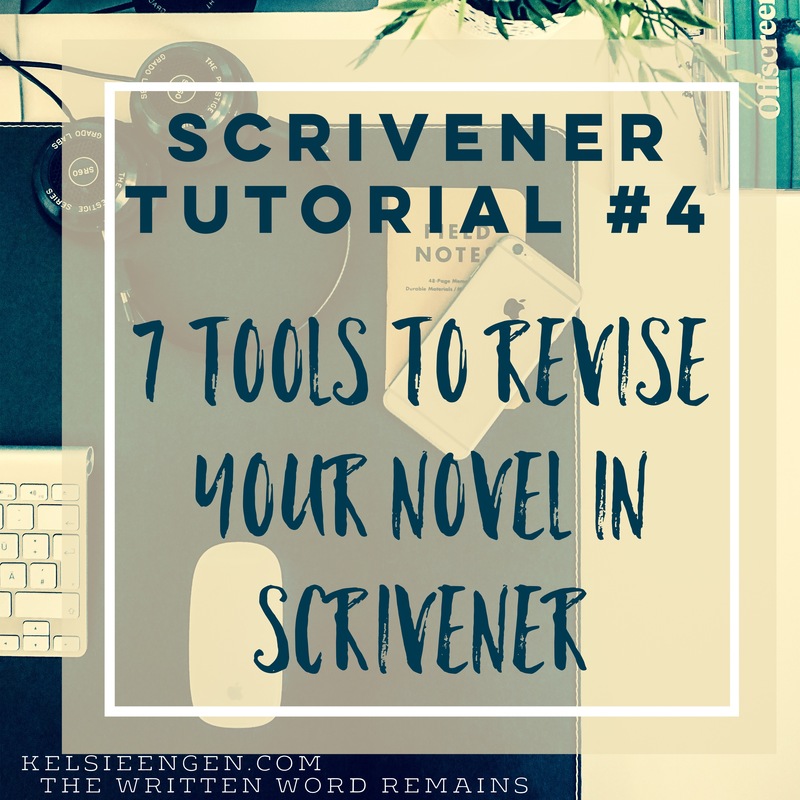 Did you know that there’s a “revision mode” in Scrivener? Yeah. It’s another pretty sweet tool I use while I revise. There are five revision modes, which basically consist of five different colors for revisions you make. In other words, if I enter revision mode and select “first revision,” any text I write after that will be red. It’s a quick and easy way to keep track of what changes you make, rather like “track changes” in Word. However, this revision mode won’t show you what you delete, but only what you add or change (if you change fonts, for example, the entire text you changed the font for will become red). Something that is incredibly useful in editing for me is the ability to look at one scene at a time. Sometimes–okay a lot of the time–it’s overwhelming to look at the entire story or novel as a whole work. It’s easier to pick one scene at a time, maybe the first, maybe the last, maybe the midpoint, and start there. Pluses of selecting only one scene at a time is that you can see exactly how many words make up that scene or chapter, you can look at your word usage stats for just that scene and perhaps realize you’ve used “glanced” or “gazed” too many times in that scene. Or maybe you simply need to fact check that scene and you can use the split screen feature to make sure the details in scene 1 correspond with scene 45. There is a nifty feature of “split screen” in Scrivener that allows you to have two scenes or documents open at once. This could be a character card and a scene which that character features in, or else two scenes that take place in the same setting and need to have the right details in, or a setting card and a scene, etc. The options are endless. Yes, Scrivener has a distraction-free full screen mode. It’s awesome, as is most things in Scrivener. But this is easy to access, and still allows you to have a few “distractions” up if you really need them, like your Inspector box and your word count box, etc. But it’s also personalize-able. You can use a favorite image for the backdrop, make the paper more or less opaque, zoom in or out, narrow or widen the paper width, put the page on the left, right, or center it; view the inspector, the keywords, how many words and characters are in your document, as well as use the “go-to” in order to enter a new scene without exiting full screen mode. See my earlier Scrivener Tutorial #3, link below, for information on this as well as using goals in Scrivener. But a short version is that it will tell you every word you use and how many times you use it in your scene, chapter, or manuscript, whichever you have selected. It’s well worth using to discover any “crutch” words or over usage of a character’s name or emotion, etc. This week’s writing tip regards one of the final steps of revision: proofreading. I can’t stress enough how important proofreading is. It can be the difference between looking like a professional and looking like an absolute amateur. From an editor’s standpoint, proofreading is the last editing to take place, after developmental, line, and copy edits. So this type of editing is focused not on grammar and facts, rather on formatting and appearances. 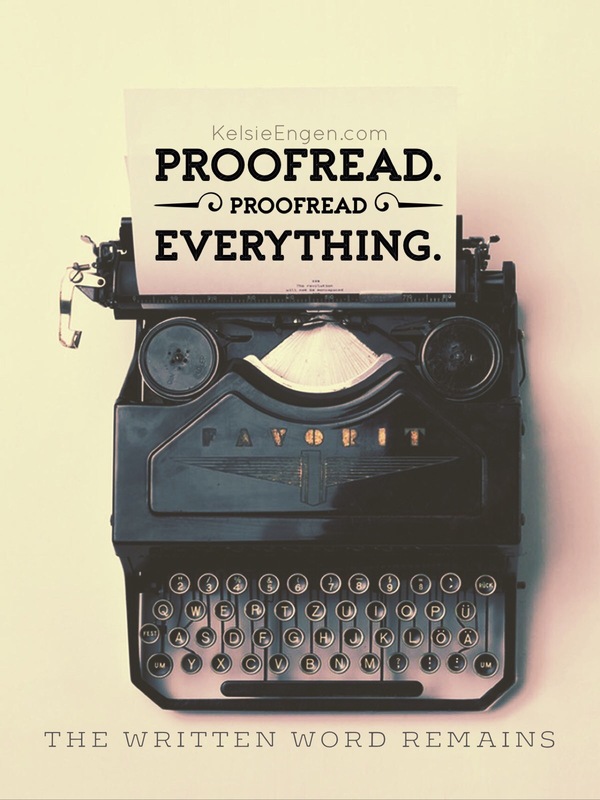 Proofreading services include (but aren’t limited to): checking page numbers, photo captions, headers and footers, consistency in formatting chapters and other font changes, table of contents being correct, etc. Even in writing this blog post, had I not proofread, I would have had several mistakes, including “From and editor’s standpoint.” But proofreading this post kept me from making that mistake. It’s a quick and simple thing to do. Do it. Don’t skip this very important editing step. Always take the time to reread an email before pressing send, and even a text. You won’t regret catching that typo. Whew. The first full week of 2016 is behind us. How have you been doing on your resolutions, writing and otherwise? My writing goals include editing Spurn the Moon and supplying it to Beta readers, editing my novella after feedback from beta readers, finishing a short story I’ve been working on for several months, as well as self-publishing a short story I’ve previously written. It should be a busy year as I look into the pros and cons of traditional versus self publishing for my novel, and debate querying it around for awhile. What are some of your goals for 2016? Or just goals for January? In case you missed them, here’s the blog posts from this past week. Learn the rules well. Then you can break them. If you couldn’t tell, we’ve embarked on a revision theme for the month of January. This month I hope to continue this theme with discussing tips on revising in Scrivener, what a plot actually is, how to find plot holes in your first draft, and how to use story structure to pump up your story. I also may go into more depth on the aspects found in the revision checklist from Wednesday’s IWSG post.